I get asked by people all of the time, how I manage to stay organized while I maintain several blogs, write books, work on projects, and work part time as well. I have to say it with one word - day planner. Or my calendar. I have taught my family for years that if they want me to remember something, it needs to be written on my calendar. I have one on my kitchen wall for all family members to write things on it, and if it isn't down on the calendar, I don't have to remember it. My organization for my blogs - binders and a planner! kitchen wall. I also have all of my blog posts listed for three to four months in advance of what I want to write on each day. Sometimes I am really good with this, and other times, life takes over and I haven't been so good with my blogs. This year is the year I will make a difference though - because I have decided! I also have a binder for each blog that I gather relevant information, prompts, and so forth in it. When it comes time to calendar in my blog posts for another few months, I just simply look through the binder and see what I have to write about, and schedule the topics in. I have all the topics and info in one place, plus I have my best friend Google, and voila....I have blog posts! I also have notebooks galore! I have a separate notebook for each major project I have on the go. 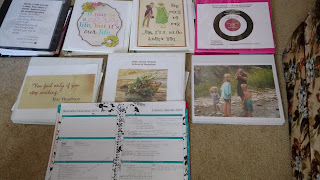 For example my daughter's wedding coming soon - I have a notebook full of ideas, pictures and to do lists. If I am catering for an event, or organizing an event, a notebook is the best place for me to keep it all organized. I also have notebooks that I use to keep track of everything. If it is printed off the computer, it will go into one of the binders, otherwise it goes in a notebook, or my day planner. I have learned the value of writing several blog posts at a time, when I have a bit of time, and then I schedule them throughout the coming weeks according to what I have in my planner. Trust me, just because you see I posted something at 7:00 AM, does not mean I was up at 6 writing it. Not likely. When I get up early mornings, I usually spend that quiet time working on one of my books, or studying something. I love my mornings, when nobody else wants to get up, no interruptions, I am most productive and do my best work at those times. Most of my blog posts are written during the evenings, or while I am spending quality time with my husband watching a movie. You got it, he watches the movie and I write. I just can't sit still and do nothing for two hours. Ahhh! I love your organization, and your binders.